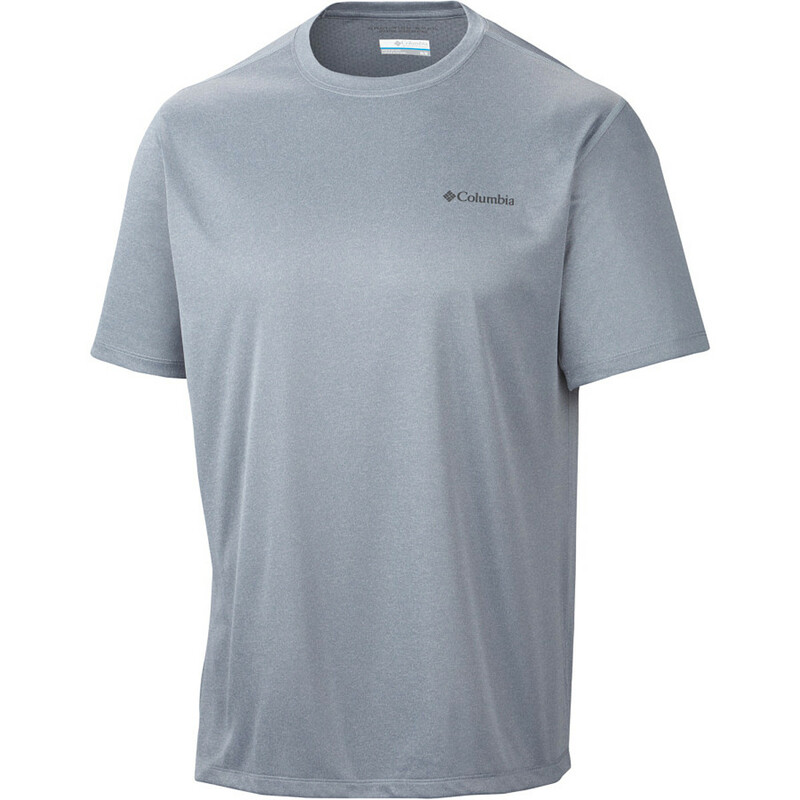 The Columbia Trail Flash Short Sleeve Shirt is a stylish, medium-weight wicking tee shirt with reflective accents. 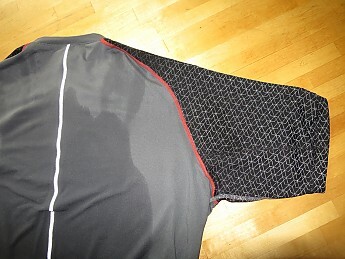 Best for running on cool spring and summer evenings, especially on roads where visibility to drivers may be a concern. Recommended if you don't mind the price. 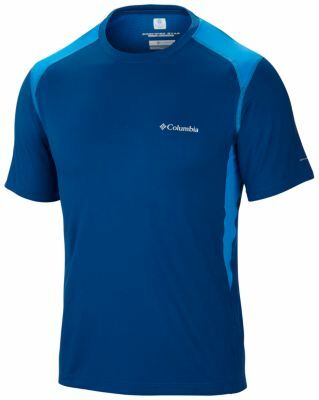 The Columbia Trail Flash tee shirt is made of a medium-weight 85% polyester/15% elastic fabric, dubbed Omni-Wick, that is said to wick moisture away from the body, with an antimicrobial treatment that is said to prevent bacterial growth and associated odors. 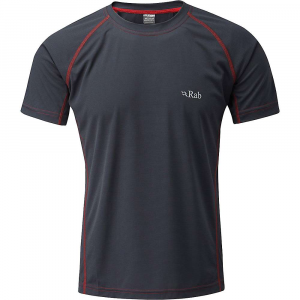 I have run at least 100 km in Norwegian spring and early summer weather, worn it on a few day and overnight hikes, and tested its drying rate in comparison with four other shirts. The shirt that I received for review has solid gray and black sleeves with a gray accent pattern, and the seams where the arms are flat-stitched to the body are done in red thread, all adding up to a stylish (if somewhat conservative) look. I actually wore it at work one day when I didn’t have any important meetings. It comes in three other color schemes: all blue, all grey, and red body with gray sleeves. The seams are flat-stitched and the stitching is tight and precise and looks like it will hold up as long as the fabric. The men’s large fits my thin frame about as well as any other tee shirt of the same size: I fill up the shoulders well enough. It’s long enough in the body with a slightly longer tail (nice detail), but otherwise rather loose overall. 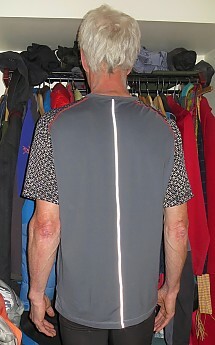 For running longer distances with a running vest or pack I would be concerned about abrasion from the back seam, but I haven’t had any problem on runs up to 17 km with a no-bounce running vest. At any rate, the seam is somewhat expendable because it would be covered up by a (hopefully reflective if needed) vest or pack. In general I would want more reflective surface than this shirt alone offers in any risky situation, and it is potentially abrasive. 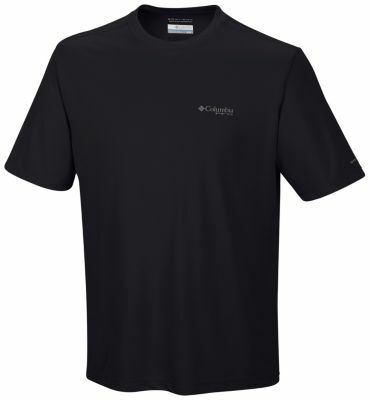 Objectively I can say it dries at about the same rate as a slightly lighter weight (155 g dry weight vs. 181 g for the Flash) cotton tee shirt, but a little more slowly than a lighter weight Columbia (review pending) and a “cheap tech” shirt (both around 145 g dry). 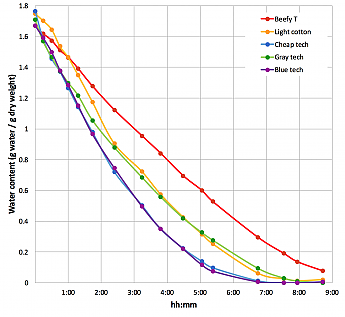 Air drying may not really test the wicking properties of the fabric, which may be driven by partially by body heat. 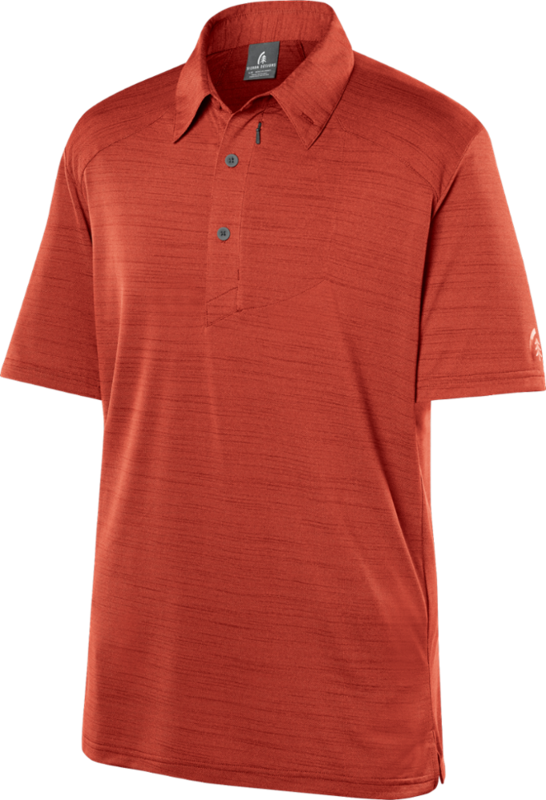 Subjectively I can say it doesn’t seem to wick moisture away any better than the numerous other tech shirts I have, but is certainly less clammy than wet cotton. 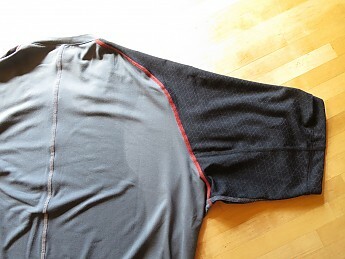 My conclusion on this is that it delivers on the wicking claim about as well as any other tech shirt of similar weight, but the Omni-Wick fabric isn’t noticeably better than in cheaper shirts. 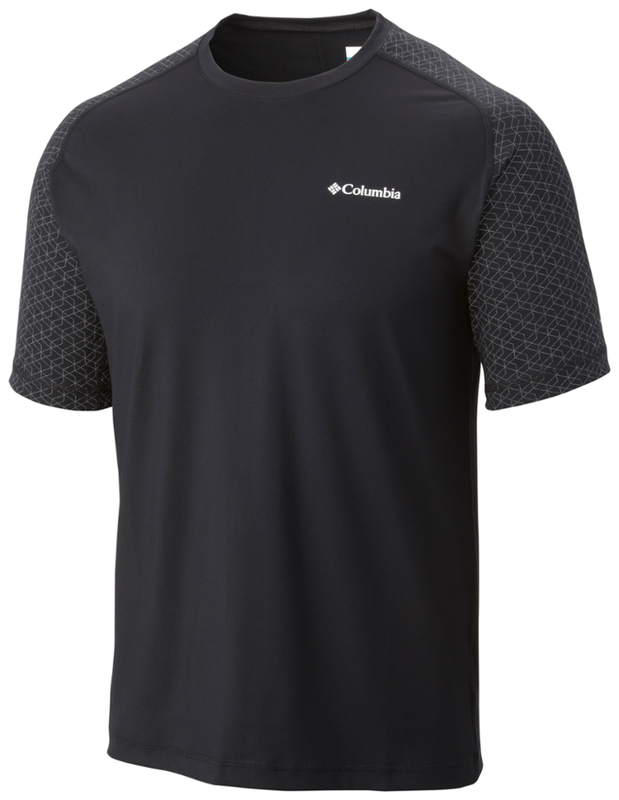 Columbia's web description also says that the shirt comes with an antimicrobial treatment that prevents bacterial growth. The treatment or chemicals used are not identified. I took a quick look into this issue and all I can say is that there seem to be various commercially available treatments, that they are generally proprietary, and that where there is more info they can get pretty exotic, for example a chemical called N-(2-hydroxy)propyl-3-trimethylammonium chitosan chloride (HTCC), another treatment that contains “ultra-fine silver crystals that release silver ions at a controlled rate only when the conditions for bacterial growth exist”, or a third treatment with a plasma containing fluorocarbon (for treating hospital clothing). Yikes! Maybe smelly old Egyptian cotton isn’t so bad after all! Anyway, I put it to the test by wearing it for three runs totaling maybe 35 km and on a backpacking shakedown cruise with a 20 kilo pack, all without washing. I can happily report that there was relatively little B.O. emanating from the shirt after all that, so the treatment, whatever it is, really seems to work. How long it lasts after repeated wearings and washings remains to be seen. 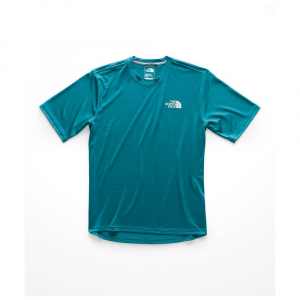 The $40 MSRP is about mid-range in the current collection of 74 men’s running shirts at REI, where a low-end tech shirt runs at half this price or less, while the big names can nearly double it. The styling and flat seams may account for some of the difference, with the rest in some combination of the fabric, antimicrobial treatment, and brand name. 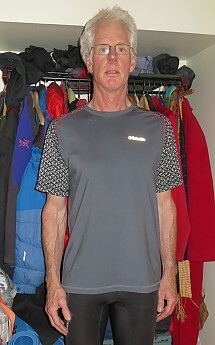 The verdict: The Columbia Trail Flash Short Sleeve Shirt is nice stylish tee shirt. It delivers as well as any on the wicking, really delivers on the anti-stink treatment, and is not for hot weather. Its best and highest use might be to wear it as fashionable outerwear for a summer evening at the pub, then run home in the dark to take the edge off (you wouldn't drive, would you?). Great dry time study, Bid Red.